Deveneys of Dundrum: Thornbridge Kipling S.P.P.A. 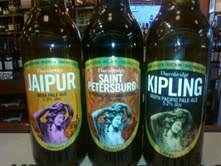 Thornbridge beers have arrived in Ireland!! A little pricier than other great U.K breweries but this is definitely a ''get what you pay for'' scenario. It's been a while since an English beer has left me thinking that if I never got the opportunity to consume another beer again; I'd be happy with this as my last. 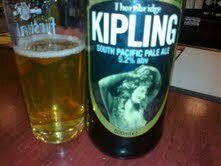 Thornbridge Kipling; I can safely say; is my new beer love. It pours the colour of a good bottled lager; lemon and honey with a thin white head. The nose can only be described as having breakfast with the man from Del Monte . White grapefruit is really prominent with some ripe mango. In fact; if you were to smell this blind folded; I'm not sure if you'd guess immediately that it was a beer. I don't want to put you off though; there's nothing sweet or synthetic about the nose. The palate is identical to the nose. It has the clean acidity of a sugar-less grapefruit; complete with that tingly feeling you pick up on the side of your tongue. The flavours are white grapefruit and white grapefruit and surprisingly; white grapefruit. I don't detect any mango or warm tropical fruit. The smooth; crisp beer flavour kicks in on the other side of the fruit and compliments the consumption process to the limit. The carbonation is evident but nicely integrated. This beer is definitely a constant reminder of longer days and warm evenings. Thorbridge Jaipur and Imperial Russian Stout available also. notes on these to follow but by all accounts; best newcomer award pending.